Here’s a recipe where you can toss the leftovers into a container and call it lunch. The tender pieces of steak go great with the corn, zucchini, peppers and edamame in this colourful succotash. Kids Cook! Get your kids involved in the kitchen by having them help out with this recipe. Here’s what they can do! * Have kids help measure most of these ingredients, but leave the spicy stuff for the adults. Have them watch as you coat the steak. And teach them about the grain of the meat. Dietitian's Tip: If succotash is new for your child, try introducing it alongside well-liked, familiar, food. When children see food on the table they like to eat they come more relaxed and may just decide it would not be the end of the world to try a forkful of succotash, or maybe not! Combine Cajun spice, cumin, salt and pepper flakes in small bowl. Set aside half of mixture. Sprinkle both sides of steak with remaining mixture. Grill steak over medium-high heat until medium, about 10 minutes, turning twice or more for medium-rare doneness (145°F/63°C). Remove to plate; cover loosely with foil. Let stand for 5 minutes before slicing thinly across the grain. Serve with Simple Succotash Sauté. I'm a bit of a stickler for cutting meat across the grain. The grain refers to the muscle fibres. Look for the direction of the long strands of muscle fibres and cut perpendicular to that. When you cut across the grain you cut into those fibres making them only as thick as the slice. It ends up being easier to chew because there are short strands of meat fibres, not long ones. Using a sharp knife is important so that you're not pressing down and squeezing out all the tasty juices (what a sin that would be!). Steak will keep for 3-4 days and succotash will keep for 3-5 days in refrigerator. Kids Cook! Get your kids involved in the kitchen by having them help out with this recipe. Here’s what they can do! * Measure out the ingredients, mix and show them how to funnel the spice into a jar for storage and future use. Be sure to label it with your child's name, as well. After, all they mixed it up for you! 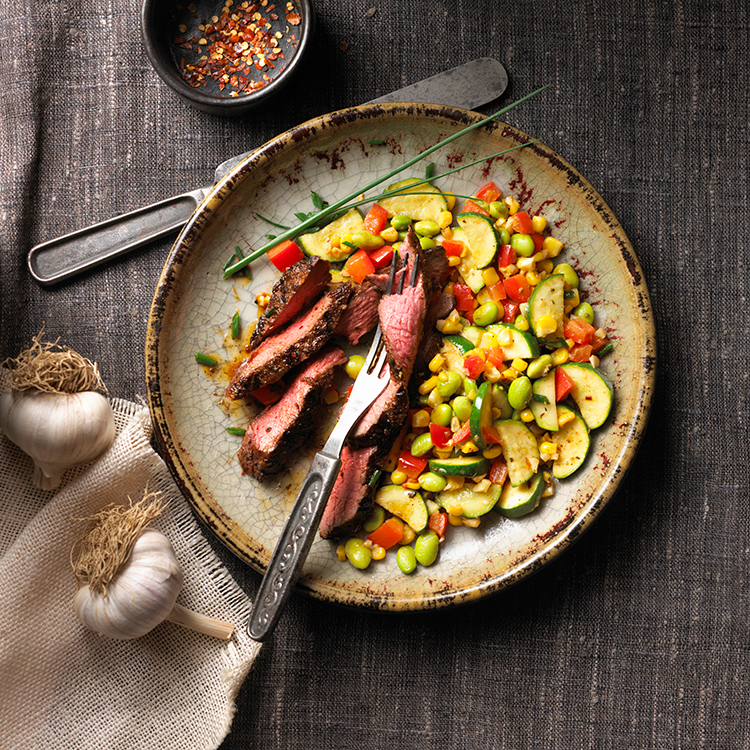 Succotash Sauté is a simple side dish that is the perfect market fresh pairing with the Cajun-Spiced Steak. Will keep 1-2 years if stored in sealed container in cool dark cupboard. Growing up the only succotash I ever heard of was from Sylvester the cat exclaiming, “Suffering succotash!” when he was, yet again, surprised, or aghast. Turns out, succotash is a favourite cooked vegetable dish from the southern US. Apparently, it’s often made with lima beans, so I suppose you could swap the edamame here out for lima beans if you want to be more authentic. I’m pretty jazzed, I must say, about having a new use for lima beans. Kids Cook! Get your kids involved in the kitchen by having them help out with this recipe. Here’s what they can do! * If you're using kernels from the cob, show kids how to hold the cob to cut the kernels off. Zucchini and peppers they can chop with a kid-friendly knife. And after, measure out the edamame and herbs. What a help! Dietitian's Tip: If you not sure if a new vegetable recipe will go over well with your child consider calling them into the kitchen to help make it. As they become more familiar with new foods they will be more likely to try them. Don't consider it a total flop if they don't try it. It's all about baby steps. Add minced garlic cloves, corn, zucchini, sweet red pepper and shelled cooked edamame and reserved half seasoning mix. Cook, stirring occasionally until just tender, about 8 minutes. Add minced fresh parsley or chives. Steak will keep for 3-4 days, and succotash will keep for 3-5 days, in refrigerator. Here’s an easy soup idea to use up leftovers. If your child is not interested in soup for lunch, suggest tossing diced steak and succotash into a half a whole grain pita and send with some cubes of cheese and piece of fruit for lunch. Kids Cook! Get your kids involved in the kitchen by having them help out with this recipe. Here’s what they can do! * Have kids help you slice the steak into smaller pieces and slice up the fresh tomatoes. Show them how to measure out the rice or noodles and grate the cheese. Once the tortillas have cooled, show kids how to slice them into chips! Cut leftover steak into slivers or small cubes and toss with remaining succotash saute. Add some canned or fresh diced tomato and cooked noodles or rice; heat piping hot with enough chicken broth to make a soup and season to taste. Pour into a warmed thermos and pack with a lime wedge and some grated cheddar cheese and homemade tortilla chips to serve with soup. (Tortilla chips: cut a whole wheat tortilla into wedges and bake until crispy).